With a realistic, heart-pounding medical thriller you can expect some intense scenes, but award winning author Dr. Thomas Jay Berger ups the stakes with behind-the-scenes hospital politics, questionable ethics, racism in hospitals and other issues that only someone who has really experienced this kind of life could give. 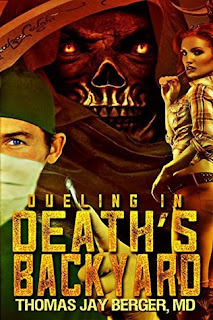 We caught up with Dr. Berger to talk to him about some of the hard stuff found in his novel Dueling in Death’s Backyard. Without giving too much away, we find that an ICU nurse has become quite powerful because of who her protector is. How realistic is this? Do nurses have that much power? Dr. Berger: The Birmingham VA ICU in Dueling was a real problem. Just as in my novel, patients were occasionally found dead, with normal vital signs recorded on their charts for many hours after their hearts had to have stopped beating. To my knowledge, no nurse was ever disciplined for this. VA positions are civil service protected and it is virtually impossible to fire anyone. I should add that there are also excellent VA hospitals, like the one in Asheville, North Carolina, which is associated with Duke. I served there as Chief of Surgery and an Associate Consulting Professor of Surgery on the Duke faculty. Even in non-VA hospitals, in these days of political correctness, a nurse can kill a patient and if the doctor involves uses intemperate language towards the nurse, he will be in trouble and the death will very likely be whitewashed. If the nurse is protected by a powerful staff doctor, for whatever reason, this becomes even more likely. Don’t get me wrong. I have tremendous respect for the vast majority of nurses. They do an extremely difficult job very well for way too little pay. Dueling describes several superb nurses, some of them based on actual people with whom I have worked, and only one really bad nurse. From my work as a medical expert, I can tell you that bad doctors are a lot bigger problem today than bad nurses. Your characters are set in the deep South and there are some uncomfortable moments of prejudice depicted in some scenes. Why include that? Why is that important to the story? Dr. Berger: There was really no choice about including that. That’s the way Birmingham, Alabama, was in the 1970s. That’s how people talked and how many of them thought. Cooper and I both experienced culture shock in Birmingham and that increased the stress of our residencies. Cooper reflects my feelings about the deep south when I, like Cooper, had only been there for two years. By the time I completed my seventh year of surgical training, I had come to love the South. In fact, I now consider myself a Yankee by birth but a rebel by choice. There is no more prejudice in the South today than there is in the North, and even back in the seventies everyone who used racist language was not necessarily a racist. That may seem hard to understand but, if you read the book, you will get it. In Dueling, I tried to present Southerners accurately as including the best and worst of humanity – just like Northerners or any other group of folks. Have you had any backlash from the medical community about how you portray the hospital and people who work there? Dr. Berger: Dr. Kirklin’s son is also a cardiac surgeon and the current chief of the Birmingham program. He loved my novel and especially the way in which I so accurately described his father and what it was like to work under him. I have also had rave reviews from many other physicians and nurses. My problems with the medical community relate to my activities as an expert witness not as a writer. I have told the truth in court and depositions about many patients injured by the negligence or incompetence of their doctors. The so-called malpractice crisis is not a crisis of frivolous litigation, as it is often portrayed. It is a crisis of bad medicine. Rather than working to punish or re-educate the few bad doctors, some powerful medical organizations have circled the wagons around them and attacked those who, like myself, stand up for the patients they have harmed. This is the old conspiracy of silence back again, stronger and more organized than ever. The Society of Thoracic Surgeons, for example, has set up kangaroo courts which attack experts who have told the truth about patients harmed by its members. This is not unlike the Mafia which also goes after those who testify against its members. At least the Mafia is honest about what it is doing and why. Dr. Berger: Actually I have written a number of scientific articles as well as a chapter in a book about medical malpractice litigation. Since retiring from active practice in 1998, due to problems with my vision, I have served as an expert in hundreds of medical cases. This work often involves writing detailed reports, which must be written in layman’s language. These reports helped prepare me to describe complex surgical procedures dramatically in a way that any reader can understand and enjoy. The way historical fiction can make a battle come alive as if you were there, my OR scenes make surgery come alive as if you were the surgeon. Writing fiction is the easiest kind of writing because you are all-powerful. You can make anything happen in the world you create - anything. Of course, that also means that you must choose what you want to happen out of a literally infinite number of options. That’s why fiction is also the hardest kind of writing. Dr. Berger: When I was about 8 years old, my father gave me a Tarzan book. I have been reading ever since and the relationship between reader and author has always seemed magical to me. If I write something that makes a reader laugh or cry, or love a character I created, that is just about the coolest thing I can imagine. That is why I love answering questions about or discussing my novel. I answer every email or Face Book query personally and, when I have a twitter account, I will gladly tweet back to any reader who tweets me. You can buy Dueling in Death's Backyard HERE! 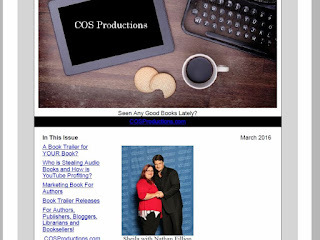 COS Productions Presents some of our favorite trailers! Oh the joy of sending out a newsletter! And of course the equal joy of getting one! We all look forward to it, waiting with anticipation to create or receive it. Yeah, that may not be how it is for some. Me, being one. Newsletters often get ignored in my inbox. And I labor over creating them, wondering what topics to address, what people need or want and how to be witty. 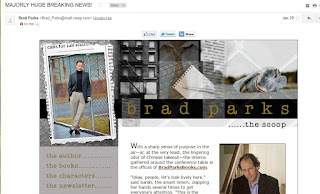 If you LOVE newsletters please let me know why! With that said, I will say that there are newsletters that I open. Some I open the second I see them come in. Brad Parks' newsletters are hilarious! Perhaps the best author newsletter out there, in my opinion. You get the information about his books that you want, but it's all done with humor. I enjoy BookBub because I get value from it. 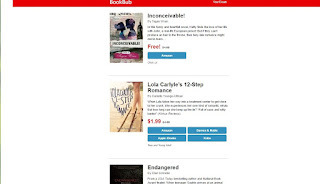 I find free and discounted books daily and am excited to see it show up in my inbox! 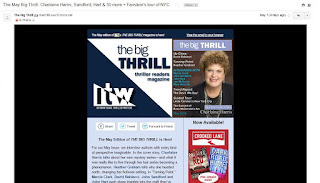 I enjoy The Big Thrill, which is a thriller magazine/newsletter because it has a variety of things I like, is easy to figure what they are sharing and looks great. I only get it once a month and think of it more as an online magazine. And I can't wait to get my weekly newsletter/eblast from Clients From Hell because, not only is it funny, not only are they all true stories, but they make me feel like I'm not along in my frustrations. I get a sense of community from it. 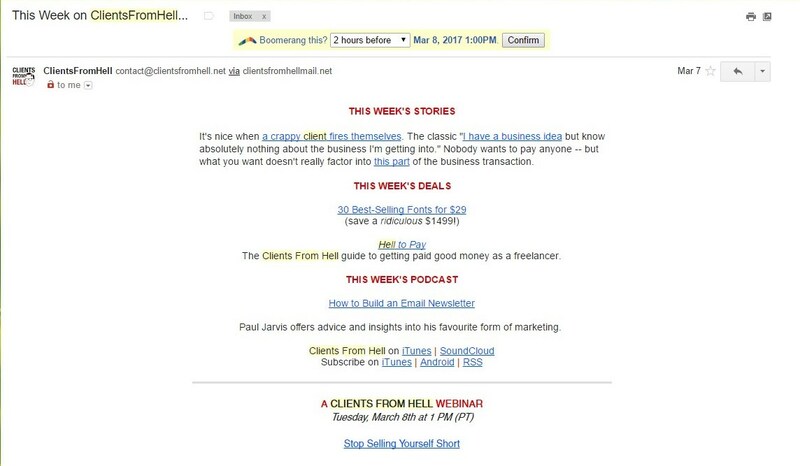 Here is my take on newsletters. A newsletter should have personality. It should be informative and fun so people look forward to getting it. 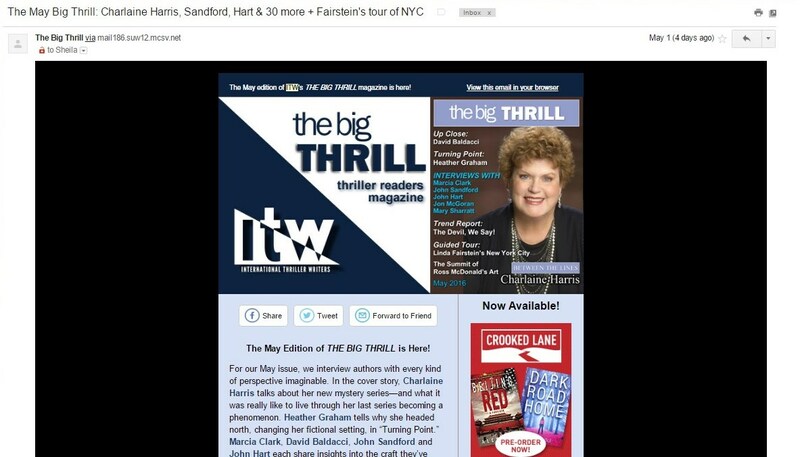 Newsletters are either meant to inform everyone who has expressed a specific interest in you and your work, or it is meant for that but also treated like a "member's only" event with special "insider" information to encourage more people to sign up. You need to determine with is best for you. 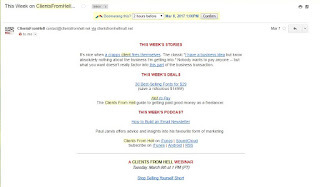 If the newsletter is being done to get your message to the most people possible then I would suggest that you make it available on your website or blog a week or two after you send it. It re-purposes the newsletter so you get more for the energy spent creating it. Make sense? But, if it's being used as a way to make people feel they are part of an exclusive community, then I would recommend that you put something in your social media to let others know what they are missing in order to encourage them to sign up. Newsletters can be time consuming, so be sure you get the most out of them. I find that my own newsletters are most effective when I do them bi-monthly. When I've done something fun and exciting. When I have something of value to give or share. When I make it easy (at-a-glance if possible) for people to see what's available. I have different types of newsletters. I have one for the general public. I have one for industry people. I have one for book bloggers and librarians who specifically ask for our material. Each type of group has a different need, so I break the newsletters up so I'm customizing to the needs of the recipient. Know what you want your newsletter to do. Know how to re-purpose it, if possible. It's a big resource and outreach for you, so get the biggest return on investment of your time and money when you create one. Book trailers are like movie trailers, but for books and COS Productions created the now popular market for book trailers. Here you will find fun and insightful information about your favorite author, industry tips, book reviews and more! Check out the Reader's Entertainment TV Blog for the latest trailers and book entertainment news!